Background: Perhaps the biggest predictor of one's health is one's wealth. It's not just the poor who are suffering; every step down the class pyramid corresponds to worse health. Study after study has shown that those at the top of the class pyramid live on average longer, healthier lives than the rest of us. The middle classes fare worse than those on the top, and the poor get sick more often and die sooner. The greater the inequality in a society, the steeper the gradient. Currently, the United States has the greatest inequality among rich countries - and the worst health inequities. People in the middle are twice as likely to die prematurely (before age 65) as those on top; people at the bottom are three times as likely. The life expectancy of American men in the highest income group is 8 years longer than for men in the lowest income group, two and a half years longer than for the second highest income group. Wealthy women live almost 7 years longer than poor women. Children in low-income families are seven times as likely to be in poor or fair health as those in high-income families. Poorer adults are three times as likely to have a chronic disease that limits their activity; twice as likely to have diabetes, and are nearly 50% as likely to die of heart disease. Wealth doesn't just bring more material comfort, it also provides financial security and access to resources that promote opportunities for better health. Higher income affects health at every age, from the beginning of life to adulthood and old age. For adults, wealth is tied to neighborhood quality, work conditions, food security, access to medical care, and the availability of buffers against stress. For children, the impact of advantages or disadvantages is even greater, because the effect on health is cumulative. The greater proportion of life one spends at the upper end of the class spectrum, the more benefits accrue. 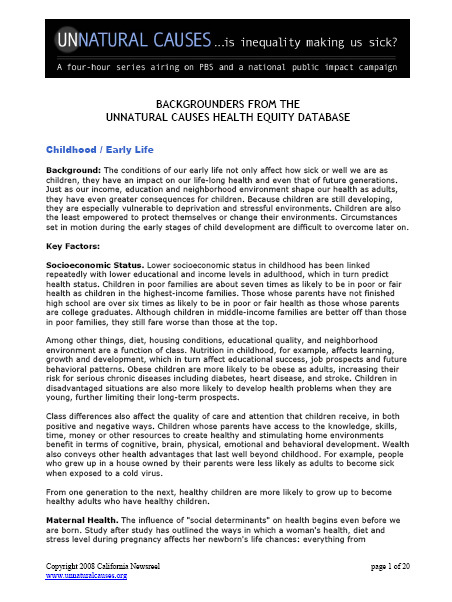 Children from affluent families are more likely to grow up in a house owned by their parents and to live in a neighborhood with healthy food options, safe places to play, good schools, libraries and other quality public services � all of which help set them on the path to a successful, healthy life. Children from less affluent families not only lack these advantages, they are more likely to experience conditions that limit their health and ultimately their life chances: injuries, inadequate or delayed health care, physical inactivity, poor nutrition, insecure or substandard housing, and exposure to toxins, high lead levels and violence. The influence of wealth on health begins even before a child is born, shaping the quality of prenatal care an expectant woman receives, her level of stress during pregnancy and her likelihood of delivering a premature or low birth weight baby. Wealth is an important determinant of health because it has such a profound effect on other conditions. Yet at every socioeconomic level, African Americans, Native Americans and other people of color fare worse than their white counterparts. Racism as a stress factor independent of class partially explains this, but racism � for example, in the form of residential segregation or job discrimination � also directly affects wealth. Today, the wealth gap in America is growing. The average CEO makes more than 250 times the average worker�s salary, and the top 1% of American households holds more wealth than the bottom 90% combined. In the last 25 years, the income of top earners has increased 81%, while wages for those on the low end of the pay scale have stagnated or declined. Our health has followed suit. In 1980, the U.S. ranked 14th in the world for life expectancy. In 2007 we ranked 29th. One out of every five American children lives in poverty. Many of the countries that rank higher than we do have policies that protect workers, support families, and provide a safety net for their citizens. These policies typically address income and wealth inequality in one of two ways: (1) they reduce the overall gap so that everyone has sufficient resources to prosper and maintain control over their lives or (2) they loosen the connection between health and wealth by making certain resources available to everyone, not dependent on a family's individual assets. Examples of policies to reduce the gap include a guaranteed living wage, earned income tax credits, family supports, guaranteed paid vacation and sick leave, secure pensions, and severance pay and job training for unemployed workers. Examples of policies to loosen the wealth-health relationship include universal preschool, better land use and zoning policies, school financing reform, universal health insurance, and stronger environmental protections and better enforcement. WHO's commitment to the promotion of equity and pro-poor policies in its disease prevention and control activities is based on the recognition of poverty as a major barrier to health and health care. In the case of tuberculosis (TB), the links between poverty and disease burden have been documented for many years. This document addresses the integration of national TB control programmes on the practical issues involved and options for action. The American Human Development Project is a nonpartisan, non-profit initiative established to introduce to the United States a well-honed international approach and tool for measuring human well-being: the human development approach and the human development index. The project’s mission is to stimulate fact-based public debate about and political attention to human development issues in the United States and to empower people with an instrument to hold elected officials accountable for progress on issues we all care about: health, education and income. "APEN seeks to empower low-income Asian Pacific Islander (API) communities to achieve environmental and social justice. APEN believes that the environment includes everything around us: where we live, work and play. And we strive to build grassroots organizations that will improve the health, well-being and political strength of our communities." The Bus Riders Union, a project of the Labor/Community Strategy Center, is a progressive civil rights and environmental justice membership organization. Its work begins with the mass transit and public health needs of the Black community, the multiple communities of the African Diaspora, Latinoamericanos, Asian/Pacific Islanders, Indigenous communities, and working class whites who are transit dependent in Los Angeles. The Bus Riders Union seeks to promote environmentally sustainable public transportation for the entire population of Los Angeles, on the premise that affordable, efficient, and environmentally sound mass transit is a human right. This brief and polemical paper suggests that one crucial but under-investigated generator of health inequalities in Britain is the strategic decision-making of the wealthy and powerful. It is argued that the post-1970s dynamic between class and state which underpins this decision-making has been largely ignored by medical sociology in favour of repeated studies of the poor and powerless. A report published July 8 in the Journal of the National Cancer Institute found that, while outcomes from the four leading cancers overall improved between 1993 and 2001, most of the decline in deaths occurred among men and women with college degrees. Among women with fewer than 12 years of education, only white women showed a signicant decline in mortality from breast cancer. The full report is available free online.